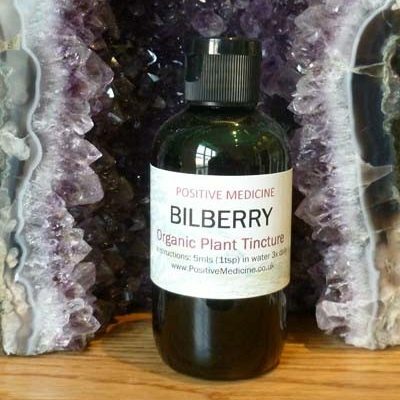 Organic bilberry tincture improves eyesight, memory, and circulation. Bilberries are one of the richest sources of antioxidants as well as being good sources of Magnesium and Vitamin C.
Improved night vision was reported by 2nd world war pilots after eating the bilberry jam that was very popular at that time. Research discovered many more healthy benefits in bilberries, especially improved capillary blood flow. This improves eyesight, memory, and circulation. Used as a nutritious wild food for centuries. The first mention of medicinal use appears in the works of Abbess Hildegarde of Bingen, a 12th Century visionary nun who was an herbalist, artist and author. She recommended Bilberry for several purposes including as a menstrual and respiratory tonic. In the 16th Century Bilberry was used for digestive upsets and scurvy. Its resurgence as a superfood began with the discovery of its effect on night vision and was further stimulated by the discovery that it has one of the highest levels of anti-oxidant activity of all foods. Science: Bilberries are rich in anthocyanosides, compounds in the plant’s dark blue pigment which are powerfully antioxidant and protect delicate tissues. An Italian trial used Bilberry and Vitamin E on people developing cataracts The progression of the cataracts was stopped in 97%. Research programmes since 1964 have produced promising results for Bilberry’s positive effect on micro-circulation and improvement in peripheral blood flow. In 2004 a Agnes Rimando presented a paper reporting on three new compounds called stilbenes, found in the blue pigment of Bilberries and Blueberries called: Piceattanal, Reserveratrol and Pterostilbene These compounds have been found to lower LDL or ‘bad’ cholesterol and triglycerides by a similar action to cholesterol-lowering drugs called fibrates. According to the scientists the compound pterostilbene triggers a mechanism that causes the breaking down of the lipids, fats and cholesterol. Bilberries are known to be: anti-hyperglycaemic, anti-oxidant, anti-aging and contain anti-cancer properties, to help memory by improved brain circulation, to help maintain a healthy heart. New studies on a selection of people in their seventies with early signs of memory loss seem to signal blueberries are really effective at helping improve and maintain good memories.